Flat Cover Standard: Our most versatile cover. A good choice if your boat is often on the move. This design allows you to fix the cover over the dinghy with the mast up or down. Great for trailing and storage with mast up or down. Two halyard points in the centre of the cover prevents water gathering. Flat CoverDeep Sides: These deep sided covers were invented originally for wooden boats with varnish transoms to stop the wood fading. But we have found that many people prefer the deep sided covers on fibreglass boats to prevent colour fades and generally keep the weather and UV off the hull. 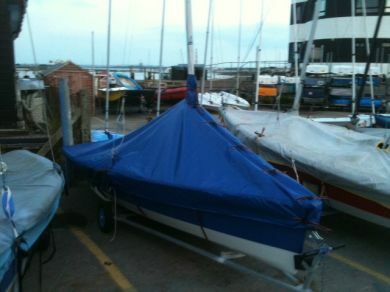 All our Laser Stratos Dinghy Covers are manufactured in our factory in Southampton, we do not sell imported covers. We use only the best quality materials whether PVC, Polyester/Cotton, Hydralite, Nylon or Weathermax.